Butch Lay has never been afraid to try something new. 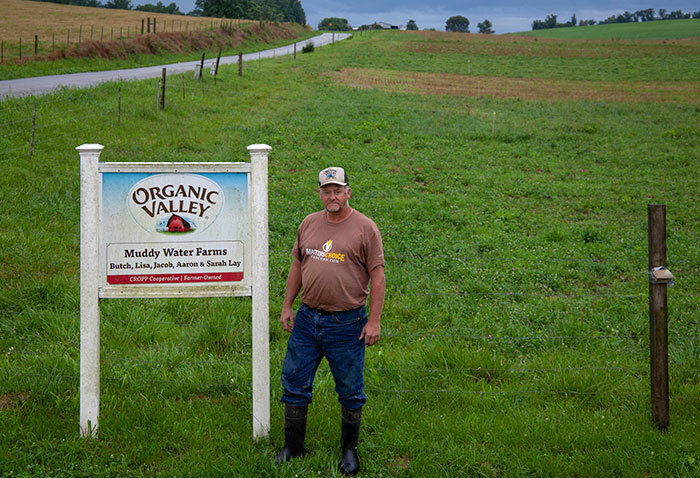 Here, the organic dairy farmer stands in front of a 10-acre research trial on his farm that is being conducted by the University of Tennessee and the University of Kentucky. Butch Lay and his wife, Lisa, are survivors. In addition to survival skills, Butch is also an experimenter, a person who is not afraid to make a wrong decision, and someone who values feed and forage diversity. The Madisonville, Tenn., couple are the third generation of Lays to farm this land. They took ownership of the cows and dairy equipment from Butch’s dad in 1994 and have three children (Jacob, Aaron, and Sarah). These days, they operate one of only two organic dairy farms that remain in Tennessee. “We had always been a conventional dairy farm; then 2009 happened and we knew a change was needed,” Lay explained. It was that year when the dairy economy hit rock bottom with prices well below the cost of production. Lay had attended a few grazing conferences previously and was already doing some grazing. He felt that becoming an organic dairy producer was a natural fit for a grazing system. In 2010, he and Lisa began the three-year process of organic certification on their acres and animals. Beginning in 2013, Muddy Water Farm started shipping milk for Organic Valley, a milk cooperative based in Wisconsin. “I’ll be organic until I quit dairying,” Lay told me on a rainy morning last week while we talked within the shelter of his pickup cab. Lay milks 65 cows and has 180 acres of pasture and cropland. Another 60 rented acres of tall fescue will be certified organic this month. That will be used for baling heifer hay. “We don’t have enough acres to grow everything we feed,” Lay said. “Our concentration is on forage, and we purchase our grain and high-quality organic alfalfa hay. When the cows are on pasture, they get a mix of grain and alfalfa hay once a day before afternoon milking. In the winter, we also include silage,” he noted. In Lay’s eyes, pastures need not be static. Rotations are a cornerstone of organic farming. The perennial pastures are terminated after four or five years and planted to a summer annual crop such as brown midrib sorghum-sudangrass or corn, which are chopped for silage. Lay also utilizes a number of winter annual species such as triticale, oats, and crimson clover. As if Lay’s own diverse pastures weren’t enough, the dairyman is currently involved in a research study being coordinated by the University of Tennessee and the University of Kentucky. As a part of that study, 10 acres of Lay’s farm is divided into large treatment plots and seeded to a perennial mixture or combinations of summer annuals, including ryegrass, red clover, sudangrass, cowpeas, oats, brassicas, and crabgrass. Lay explained that the researchers were monitoring the yield and quality of the forage while also assessing milk quality and cow health in an organic system. Several organic dairies in Tennessee and Kentucky are involved in the study. As diverse as the pasture base is, harvest systems are also varied. Lay chops sorghum-sudangrass or corn for silage, which is stored in bags. The silage is fed along with the grain and alfalfa hay during the nongrazing months as a component of a total mixed ration. “For sorghum-sudangrass to equal corn yields, we have to get two cuttings,” Lay mentioned. The dairyman also makes grass-red clover baleage from his excess spring pasture growth and bales dry hay for his heifers and dry cows. Lay doesn’t want any cows calving during the hot summer months. It’s during these months that most cows are on the tail end of their lactation, and this allows Lay to stretch his limited grazeable acres with longer rotations through the paddocks. The cows get rotated to a new paddock every 12 hours. Lay usually uses the far-off paddocks at night and those closer to the barn during the day. On the really hot days, he sometimes brings the cows back to the barn where shade is available. “Right now our biggest challenge is with the heifers and getting them big enough to calve at two years of age,” Lay noted. “They don’t get rotated as often as the cows and have to utilize our toxic fescue pastures. It’s something we continue to work on and try to improve,” he added. Lay probably will figure it out if history is a good indicator. He’s not one to remain status quo when there’s a potentially better mousetrap to be had.